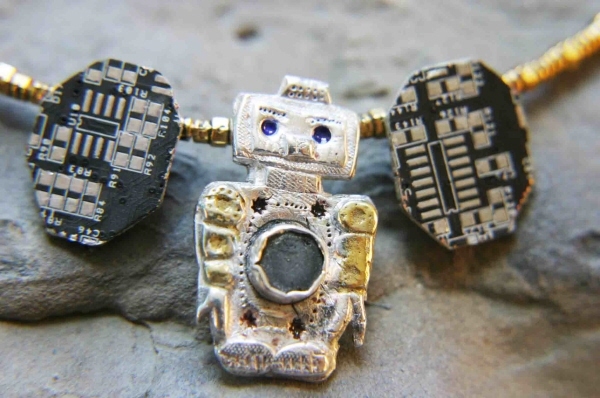 << Back Silver Robot Necklace With A Meteorite Heart! Silver Robot Necklace With A Meteorite Heart! He is intricately crafted in solid silver, with coloured enamel eyes and buttons and I have even added accents of real gold to his arms. In the centre of his body I have set a disc of iron meteorite. What could be more a more exciting addition to this cosmic chap than a piece of real shooting star! The meteorite is Gibeon which is a famous meteorite that fell in prehistoric times in Namibia. A special piece of jewellery like this deserves a special setting. Along with the robot itself I have created two small plaques from recycled computer circuit board. On the choker I have also strung some lovely little gold plated nut shaped beads. These little extras just give it that cosmic robotic touch! The robot itself measures cm top to bottom. I hope you will agree that this piece of jewellery really is something special! Boxed in a black velvet lined jewellery box and complete with a signed certificate of authenticity and A4 meteorite information sheet.